A battle hardened furniture vet like shouldn’t be surprised. I’ve seen it all. Done it all. 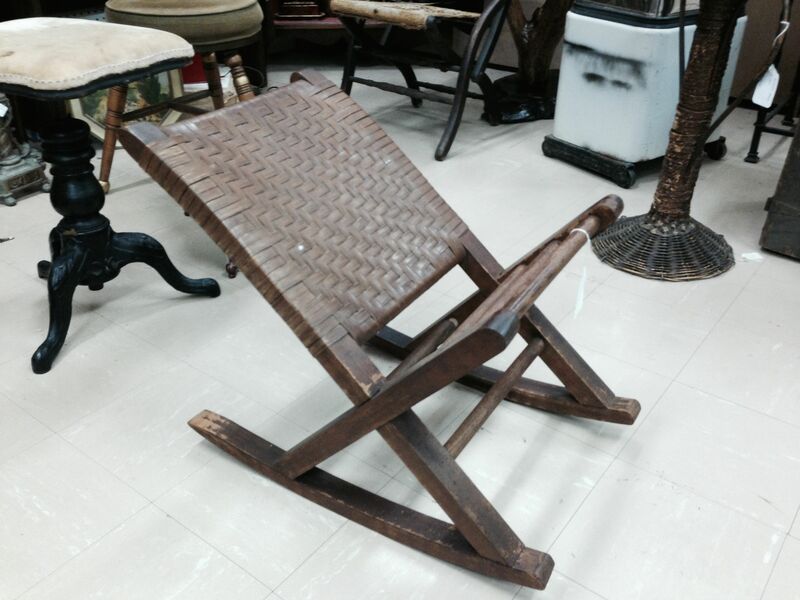 Been exposed to things that would break the average furniture enthusiast. Then it happens, I see something that I’ve never seen before. 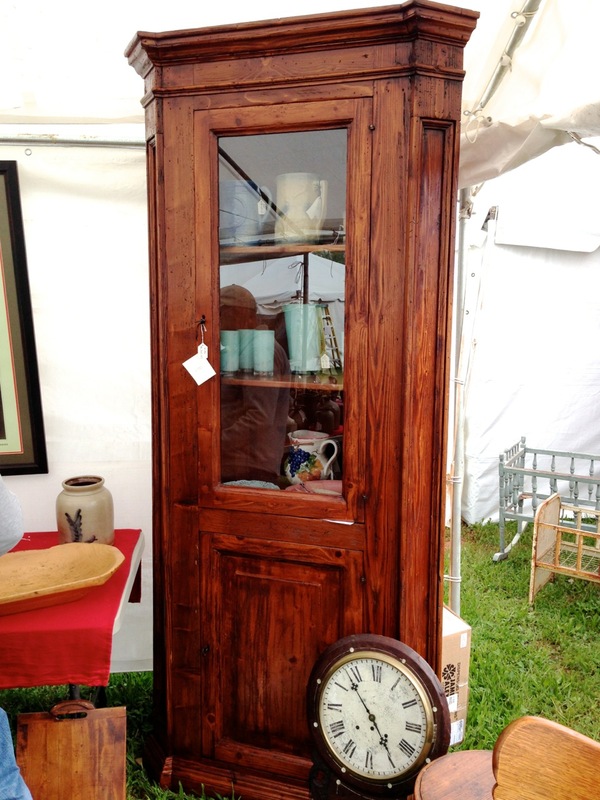 This happened last Friday at the large outdoor antiques festival. I saw something that made me stop and say “That’s different.” Three times. 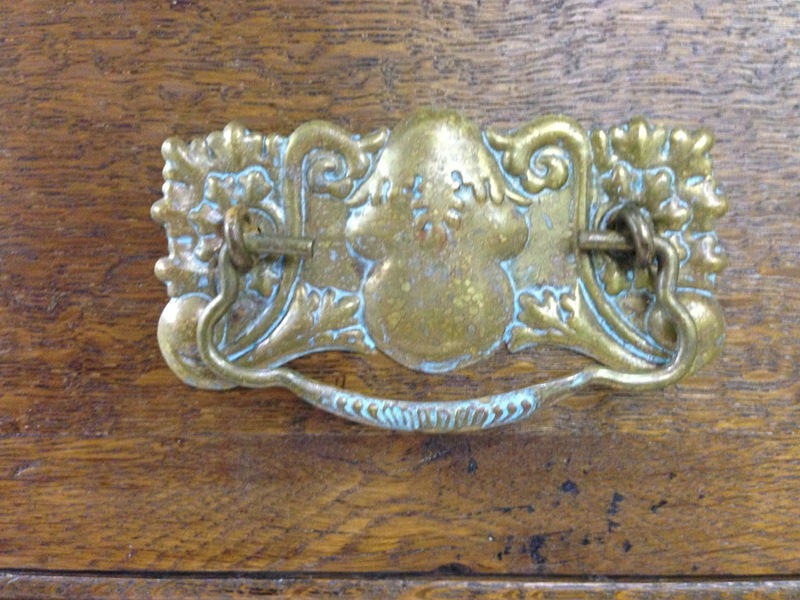 The first is a hinge that is a combination pintle and snipe (cotter pin) hinge. It was on this piece. 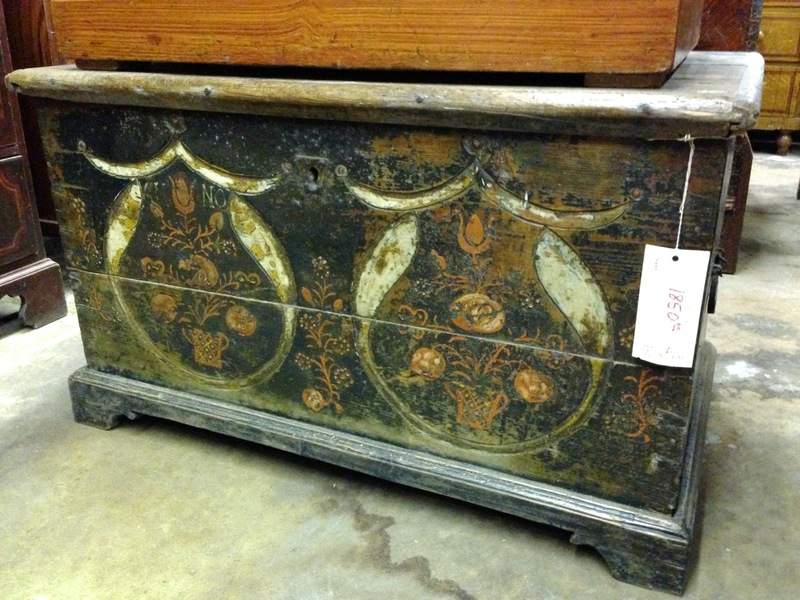 It is a semi-authentic 17th century Italian corner cabinet. 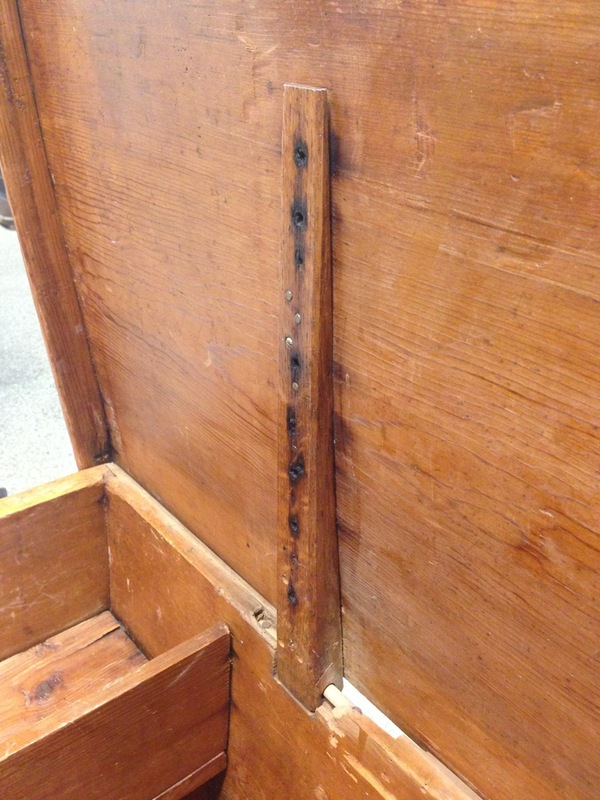 The antique frame and door were grafted onto a replacement back and sides. The corner cabinet was from a local castle. 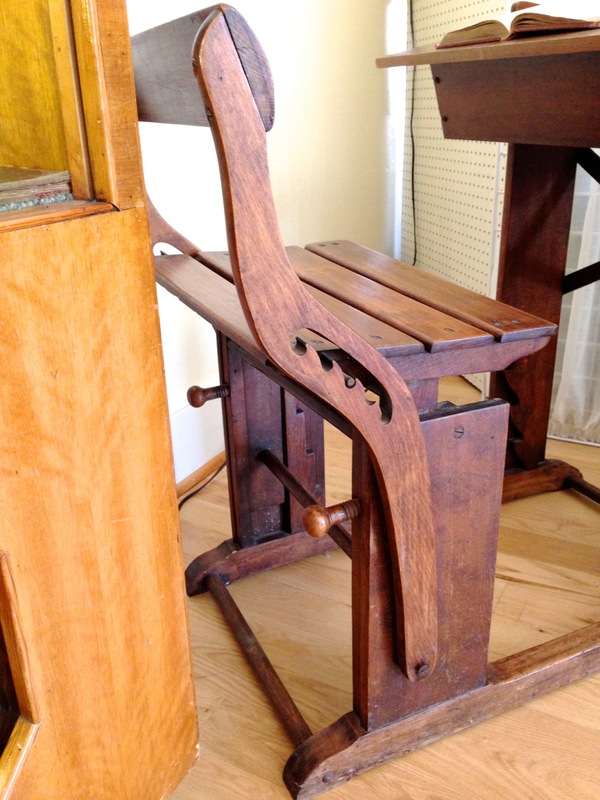 The work was done by a local vintage craftsman. (In his picture, he didn’t look old enough to be antique.) All this information came from the dealer. She seemed sincere. And she had pictures. An old facade with a new cabinet back. The next is another pintle hinge variant. 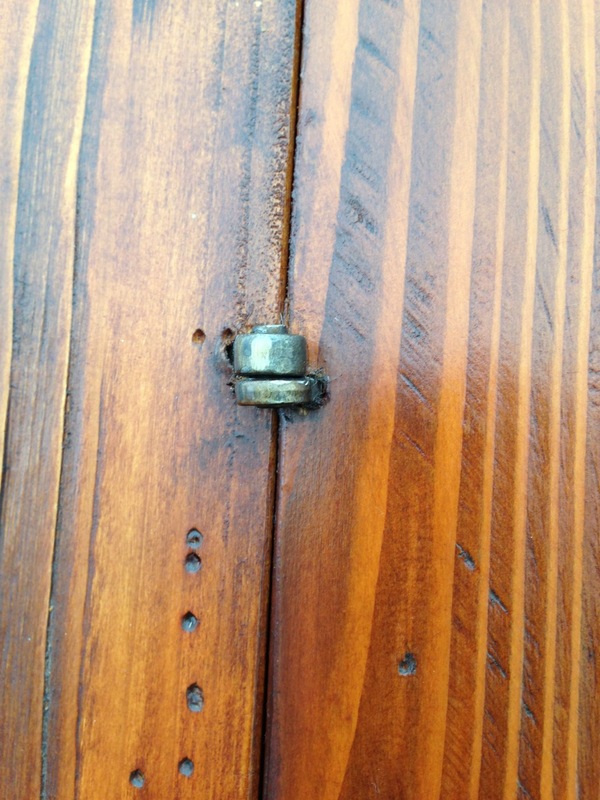 On a typical pintle hinge, there is a pin on the frame that supports the loop on the door. As above. 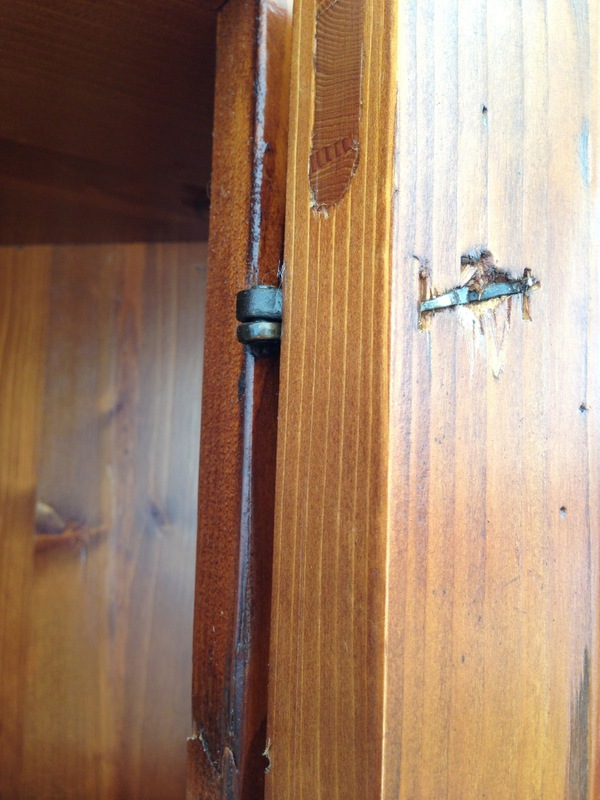 This cabinet had the reverse, a loop on the carcass onto which the pins on the doors hang. Interesting old cabinet. 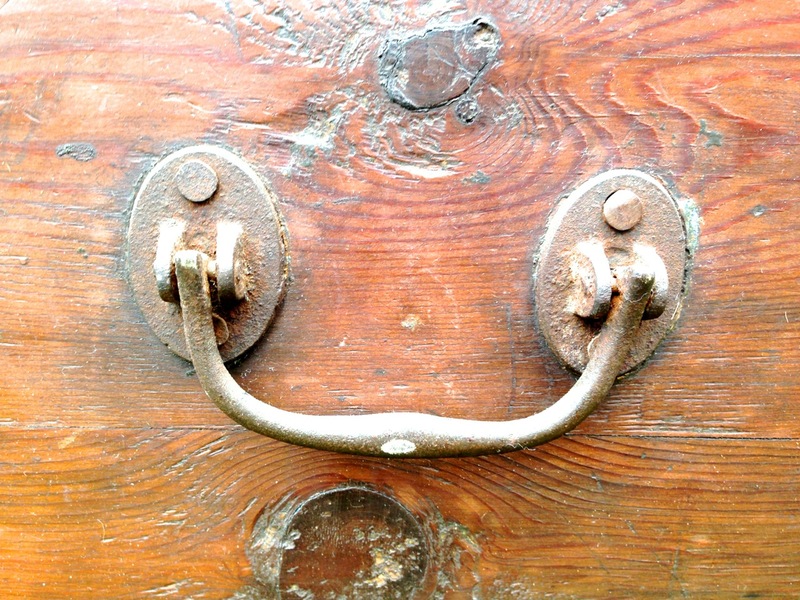 Hinges don’t seem to come from a factory. I like the handle as well. And finally, dovetails from another person that forgot to read the book. I’m pretty sure they did this one pins first. Can’t be sure how they transferred the pins. Just not what you expected. 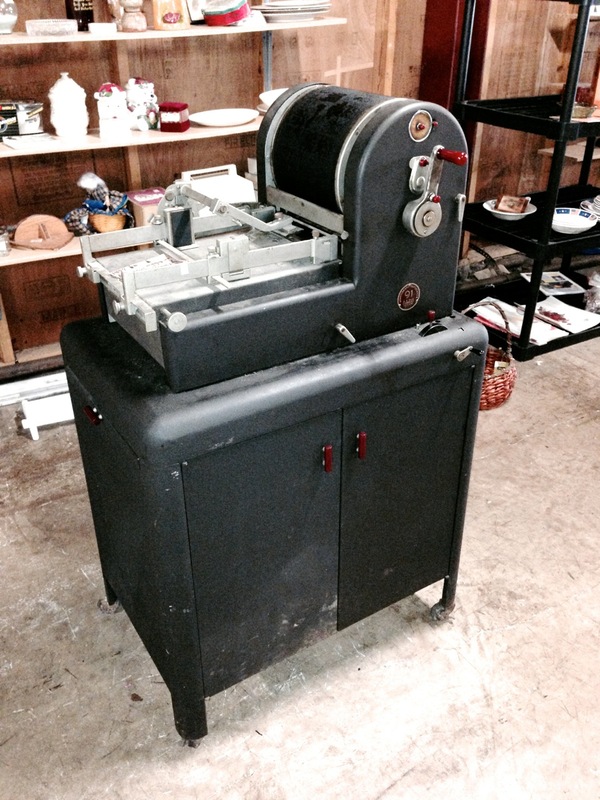 Here is my bonus oddity, a first generation Workmate®. Sometimes I have to stop and consider what to blog and other times it’s just comes to me. This one just came to me. Or more accurately, I stumbled across it. I have seen four of these in the past two weeks after living my life without being aware of seeing one. The first two I found in an antiques shop in Asheboro, NC. Separate dealers. 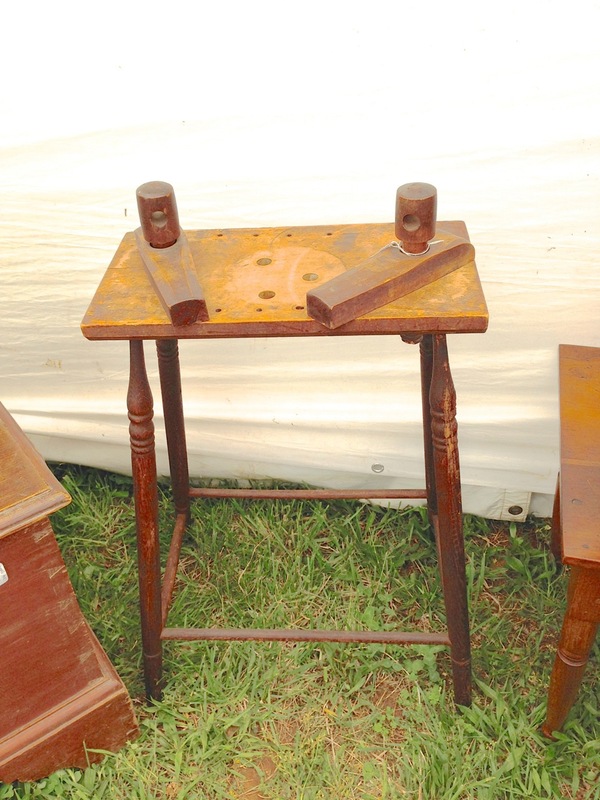 The last two were found at a large outdoor antiques festival yesterday. Again, different dealers. 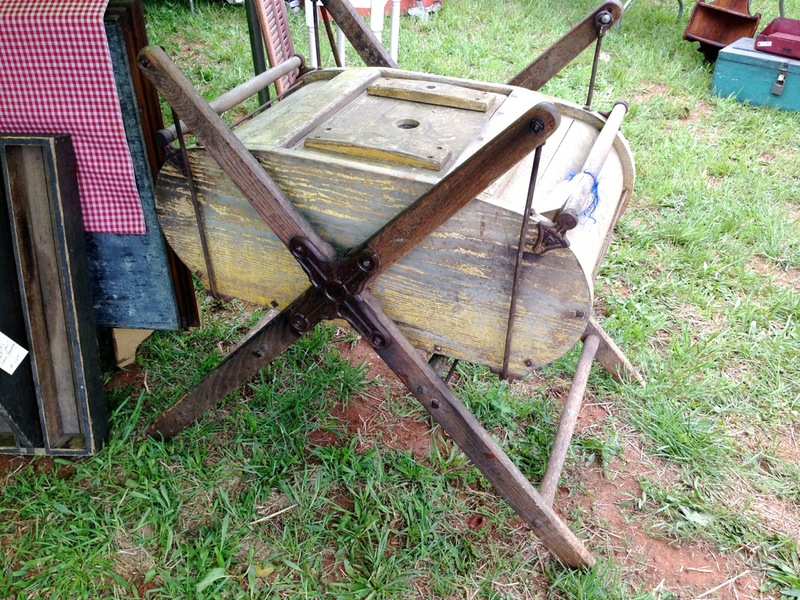 What I am talking about is the Davis Swing Churn, a swinging butter churn. 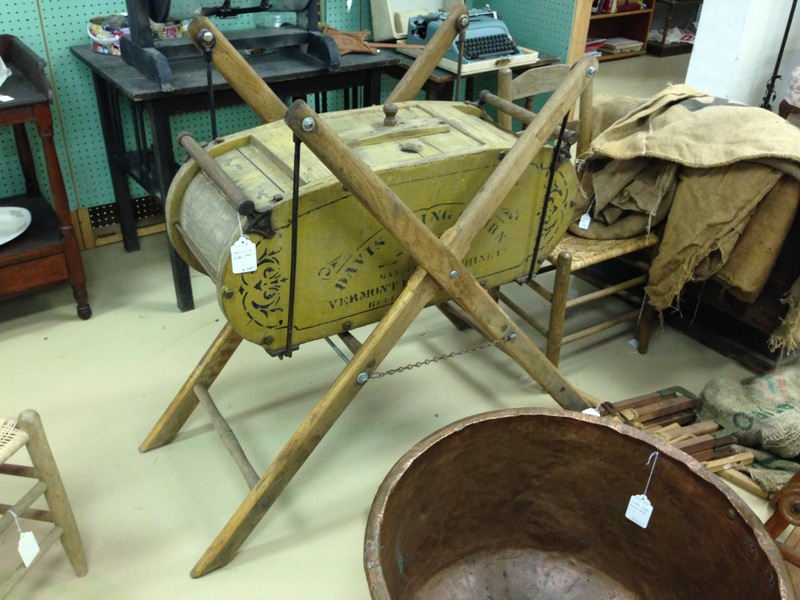 These were patented in 1879 by the Vermont Farm Machine Company, made in twelve sizes, the largest being a ceiling mounted 300 gallon churn. 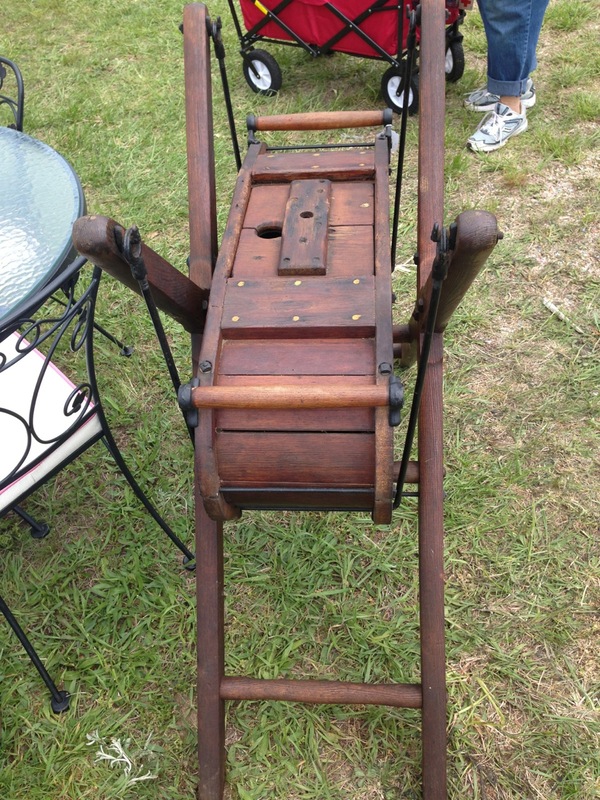 I like this line from the description: “For an additional 16 dollars this company sold a treadmill attachment that allowed a dog, goat or sheep to supply the power to swing the churn.” What would PETA think? You can read a more detailed article by Clicking HERE. I assume others made similar devices. Looks to be the original paint. Then yesterday, I found another. The dealer insisted it was a unique, home brew from a family with lots of children to churn the butter. Another civilian and I talked her down. She wasn’t happy with us but accepted it, at least while we were there talking to her. Tomorrow, who knows? Might be a larger unit. Note the cast cross brace. And then I saw a sign from the blog gods, a fourth one. Number four. I think it’s been restored. Click for another view. 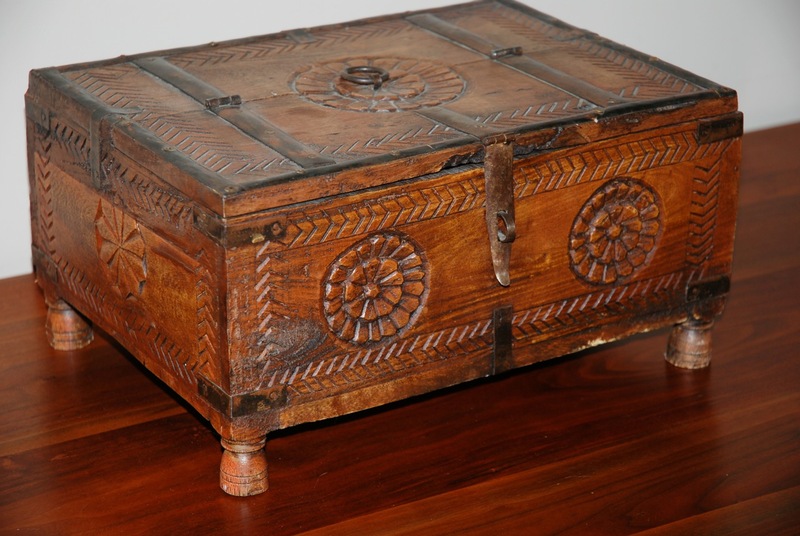 After all the conversations about the box and its origins, I decided to do a little research on it, see if it might have come from Pier One or equivalent. After an extensive three minutes of research, I found out some interesting things about the box. First I did a Google image search and found a similar box in the third line of the image search. 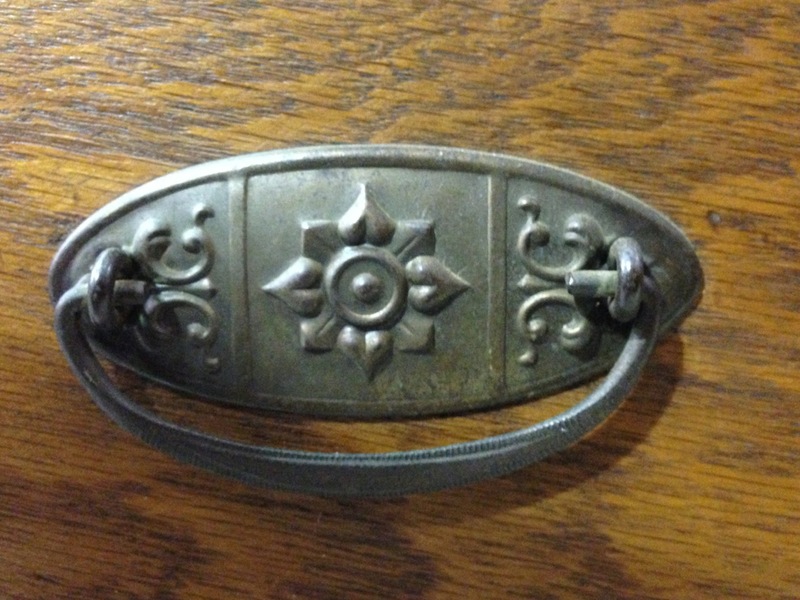 That image linked to an eBay search. A quick search on eBay found an auction with a similar box. A real similar box. Turns out it’s the same box. Not similar, the same box. I matched all the knots and irregular surfaces. It is the same bloody box. I e-mailed the eBay seller and she claimed she bought it at a tag sale in Danbury, CT. It sold on eBay on March 14th. I bought it on April 3rd in Charlotte from a dealer’s brother. (The dealer was off dealing.) The brother thought he had bought it at another auction locally. I still don’t know were it came from but I know where it’s been. 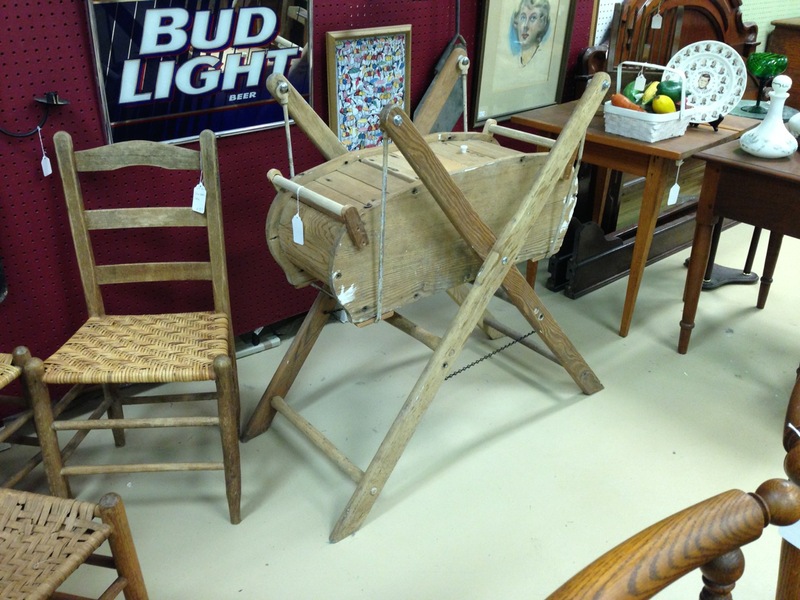 I went over to the crosstown auction house this afternoon for a preview of their Friday night auction. Again, nothing great but some interesting things. And a few lessons to be learned. 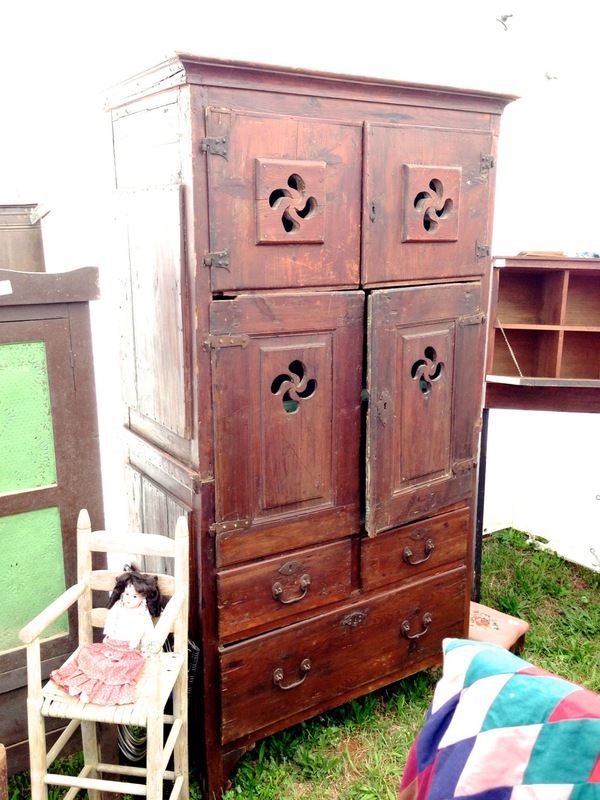 First thing is in determining the age of an armoire or press. 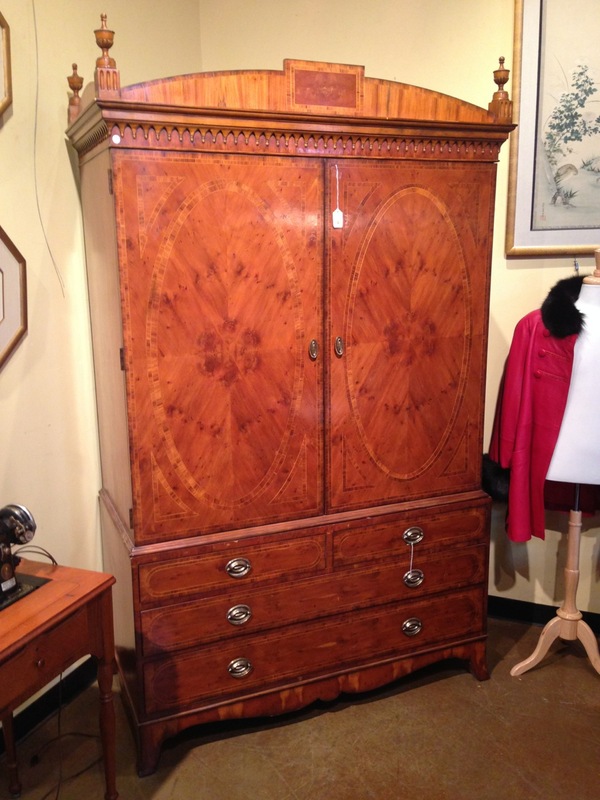 Look at the wood, consider the veneering and embellishments, see if the style matches the materials. Finally, look at the back and see if the cutout is for a flat screen or the old style picture tube TV. This cutout is for an older, conventional TV. 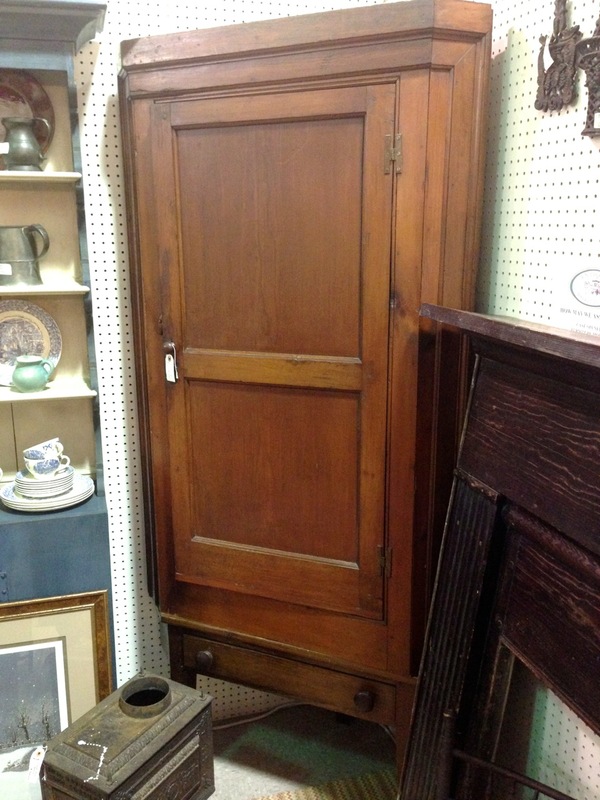 This armoire has some age. 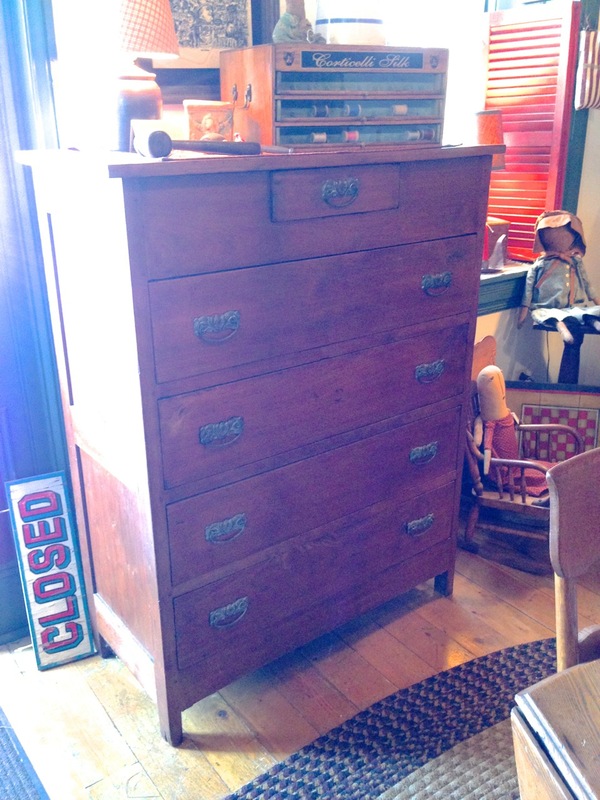 Next is this dresser with some differently sized drawers. 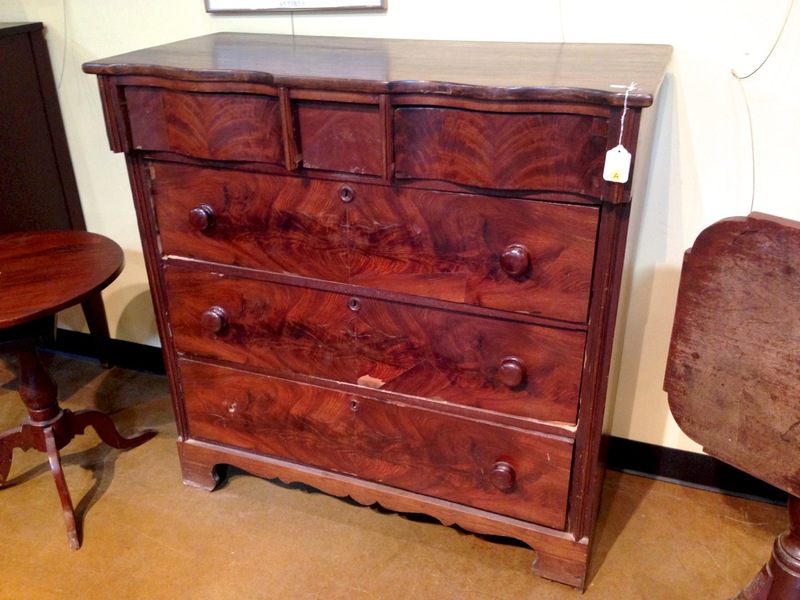 A dresser or chest of drawers. Center drawer is smaller and flat fronted. 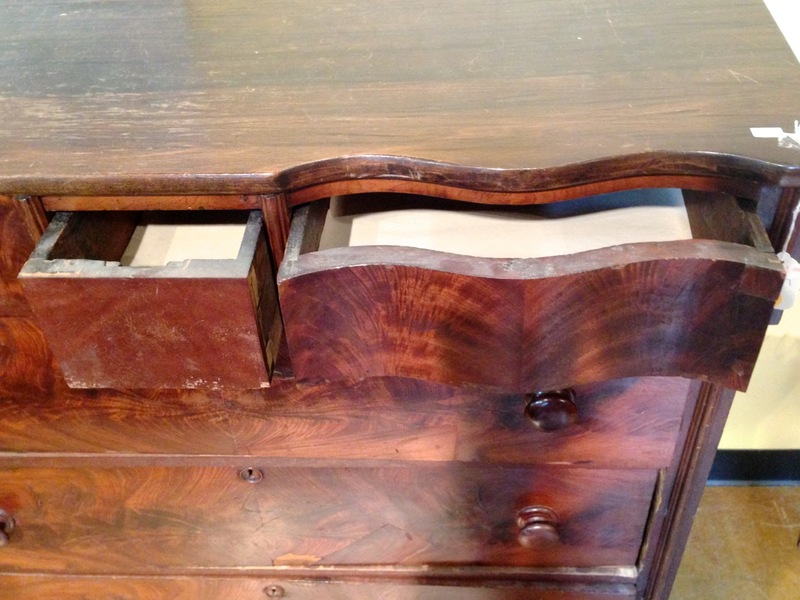 And looking at the drawer dovetails, you can see that the drawers were made by different craftspersons. And today’s lessons ends with this server. I thought it might be old, but alas, it’s not. A nice, not too old server. Once again, the drawer tells much. 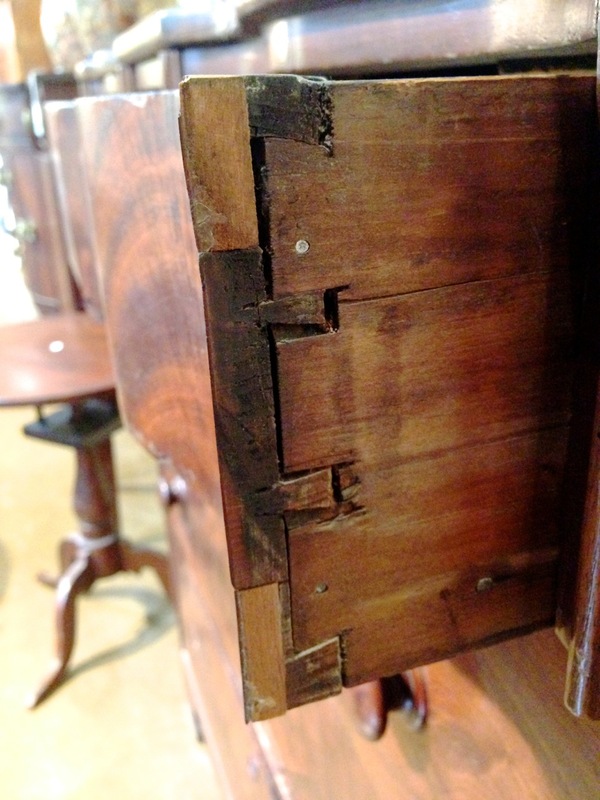 They are not dovetailed. In fact, the are made using a joint with which I was previously unfamiliar. 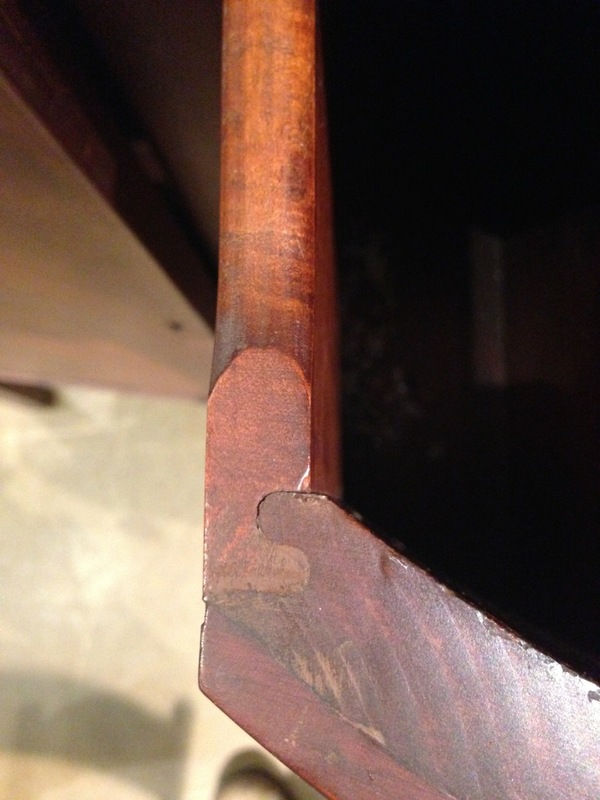 An odd, routed joint. I wonder if Whiteside still makes this bit? To see the rest of the album (set), Click HERE. 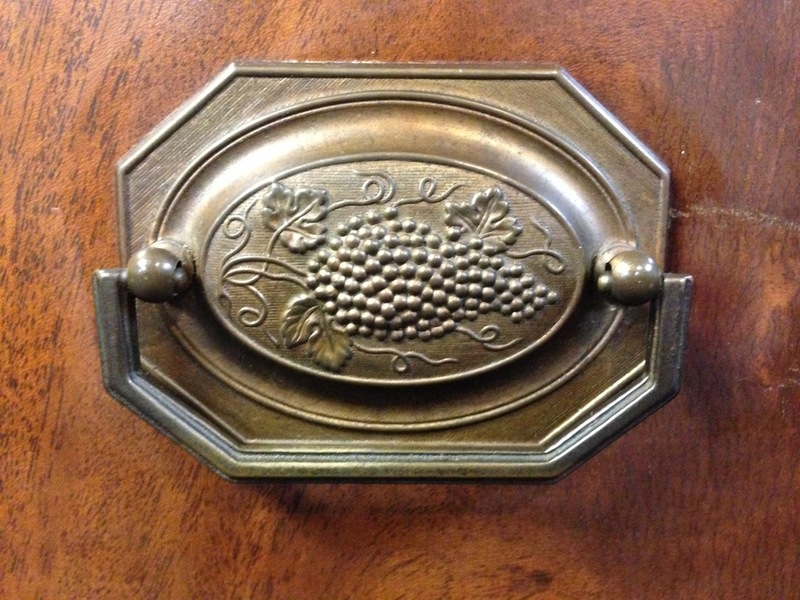 Another Thursday and another trip to the auction house for a preview of Friday’s auction. As has been the case in the past few months, nothing spectacular or extraordinary but a few things that caught my eye. A few things that I can’t recall seeing before. 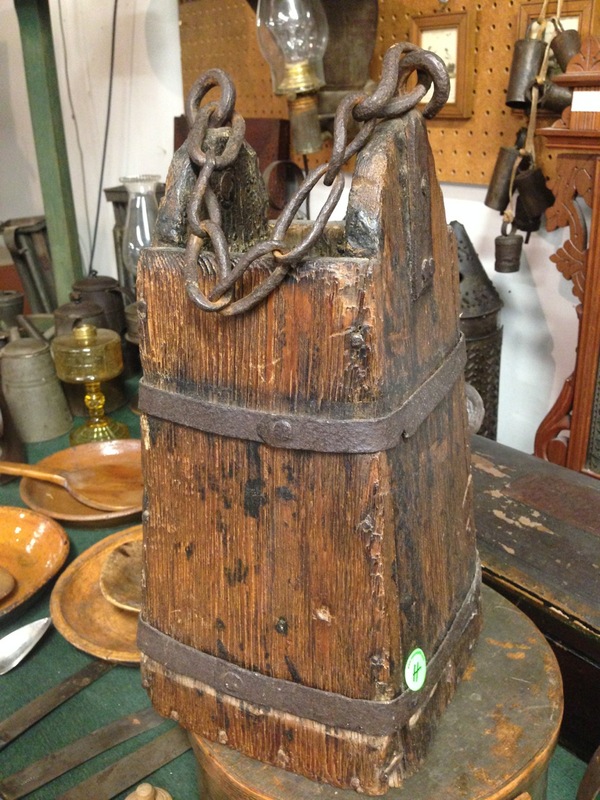 First is this Moravian stool. I’ve seen a few at Old Salem but none in the wild. 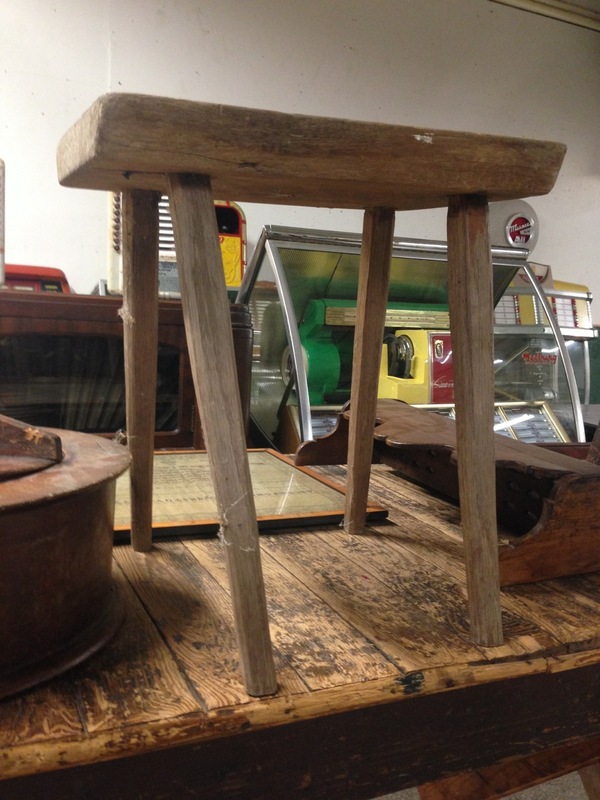 A genuine Moravian (like) stool. 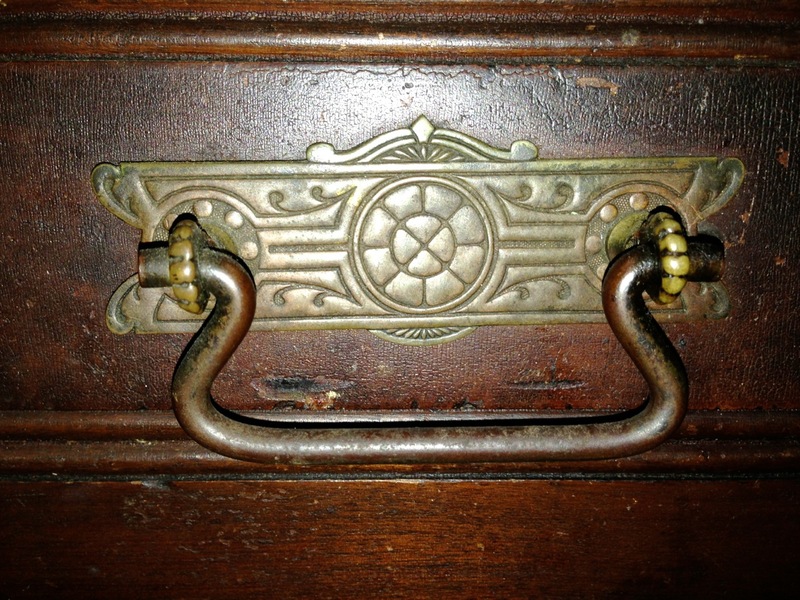 Then there is the square bucket with hand wrought hardware. Square bucket. Any theories out there? 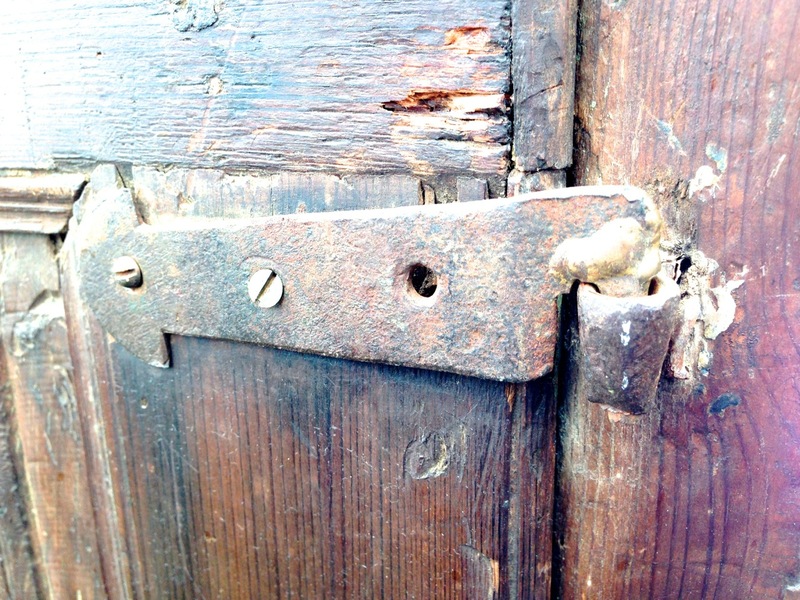 Here we see a different variant of the wooden hinge. 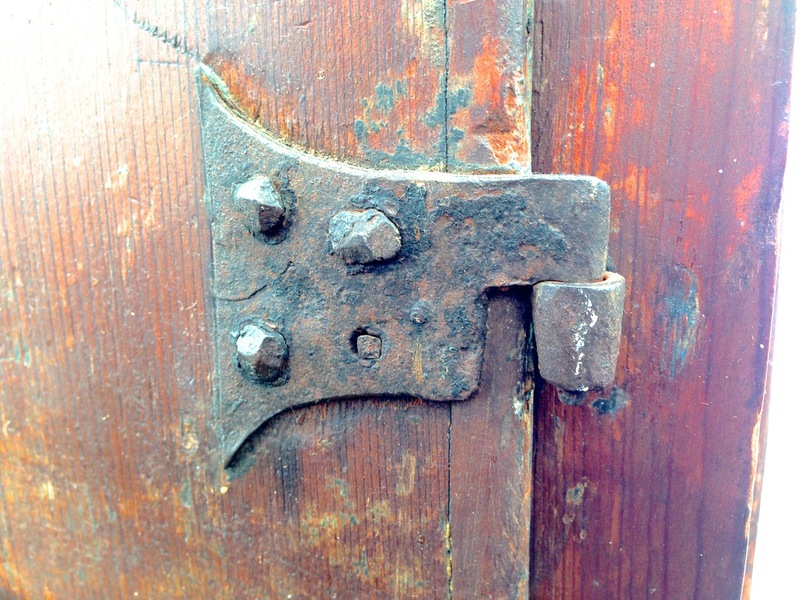 Wooden hinge. And not store bought. 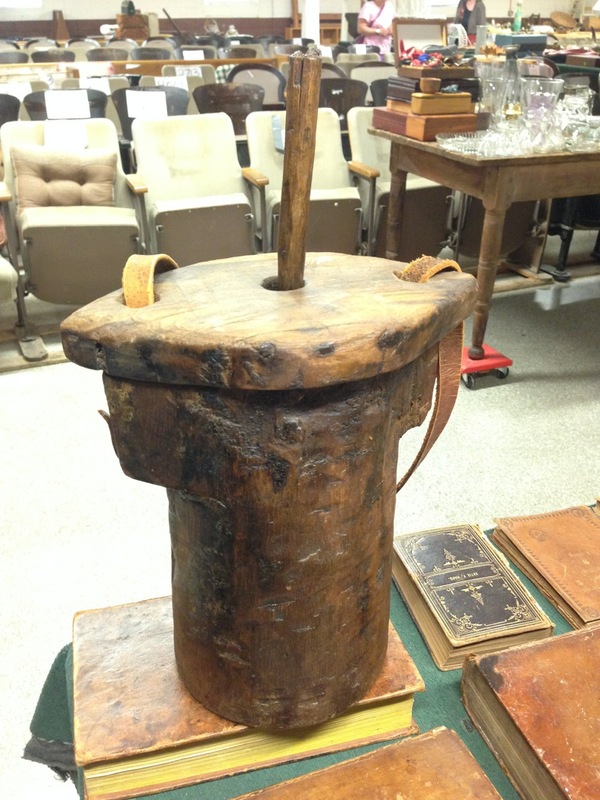 And finally a tar bucket made from a hollowed log. And many more things to be seen when you click HERE. Over the Easter weekend, my wife and I went out to Mid-Missouri for the holiday and to celebrate the significant birthday of a family member. I didn’t grow up in Missouri. My family moved there (via Denver) after I left for college. So, it’s not like going home when we visit. It’s just a nice, small Mid-Western town with no memories or emotional attachments. There was enough family coming to town that we had to stay at a hotel. What a shame. On Saturday, my wife and I were looking for something to do to avoid the inevitable family drama. Been there, done that. Looking at a list of nearby towns, we settled on a road trip to Hermann, MO. It has antiques, museums, historic houses and food. And wineries. In Missouri! Who knew. 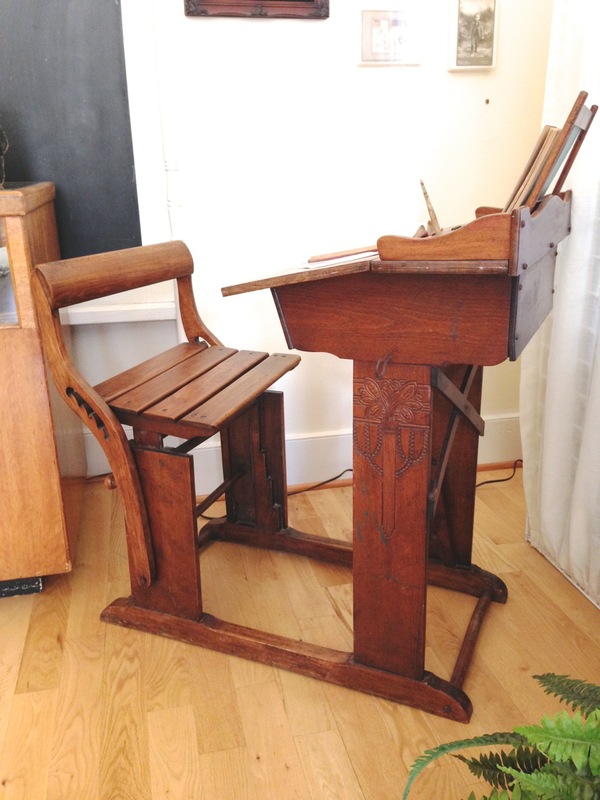 Adjustable seat on this school desk. 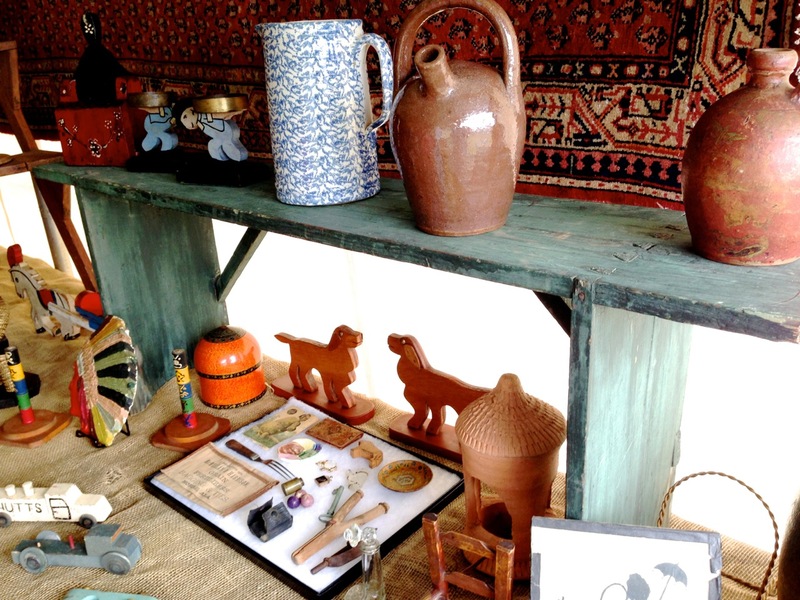 We then went and sampled some of the many local antiques shops. Nothing too spectacular but a nice assortment of furniture you would expect to see in a Mid-Western town. 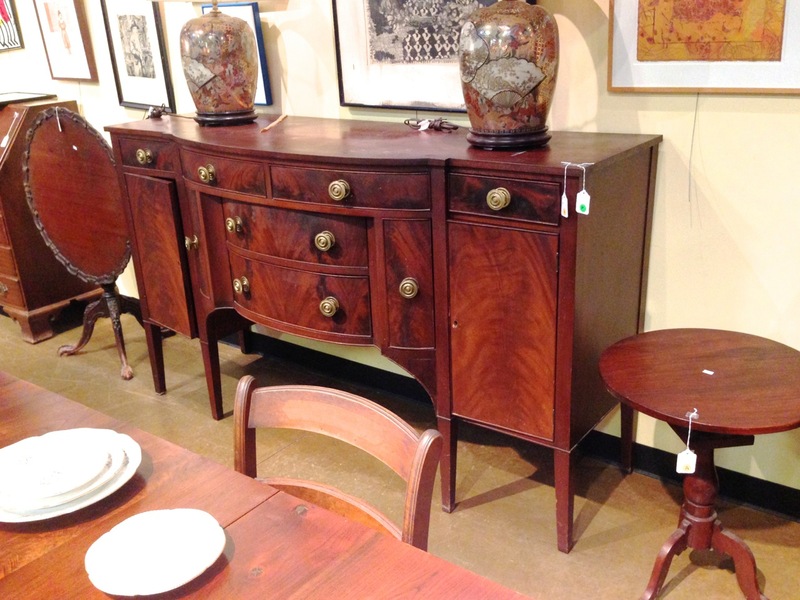 Much of the furniture is oak and made in the late 19th century. There are a few older piece just to keep things interesting. 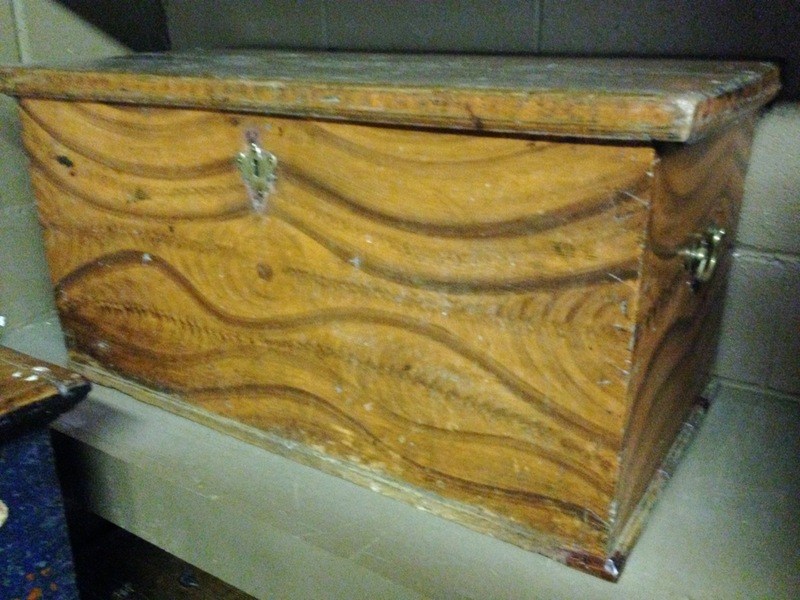 One of my favorites was this chest with a single small drawer on the top. I couldn’t get better picture because the shop owner and her friends kept congregating around it. Hard to ask them to move. Small drawer at the top is a bit of an enigma. More stuff to see. Click HERE to see the rest of the photo set. 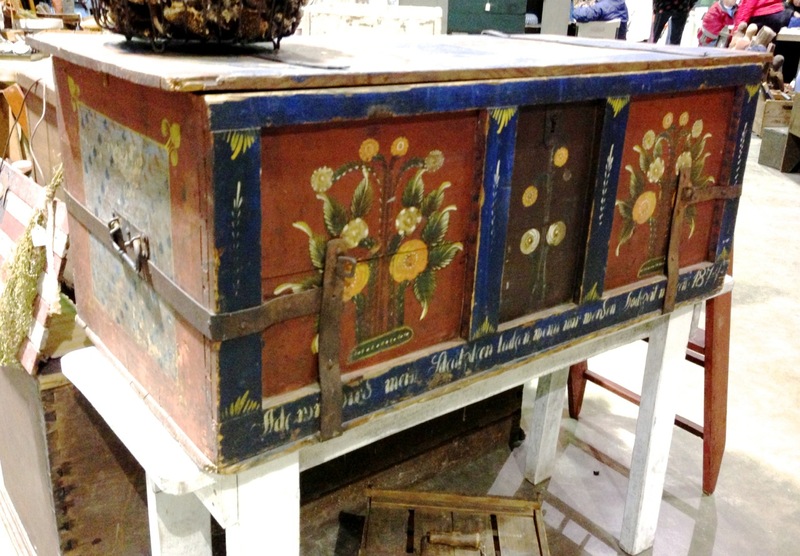 I found this box at an antiques extravaganza in Charlotte, NC., a semi-annual thing. They have monthly shows but only the extravaganzas are worth the drive. I liked the box and found it interesting. I walked away from it initially and only came back for it as I was leaving. What bothered me was that I couldn’t be sure is was actually a genuine antique or an “antique” just off the boat from Indonesia or Mexico. So, I leave it up to you, my faithful readers. I seek your opinion as to whether it is old and then if it is an import. Someone out there must have a clue or some actual knowledge. 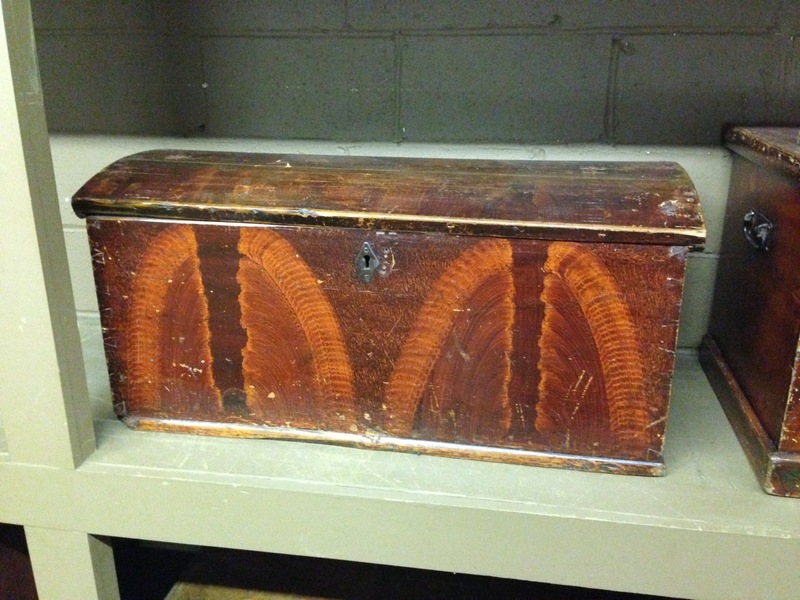 Box is around 17″ by 12″ by 7″. Made of wood. 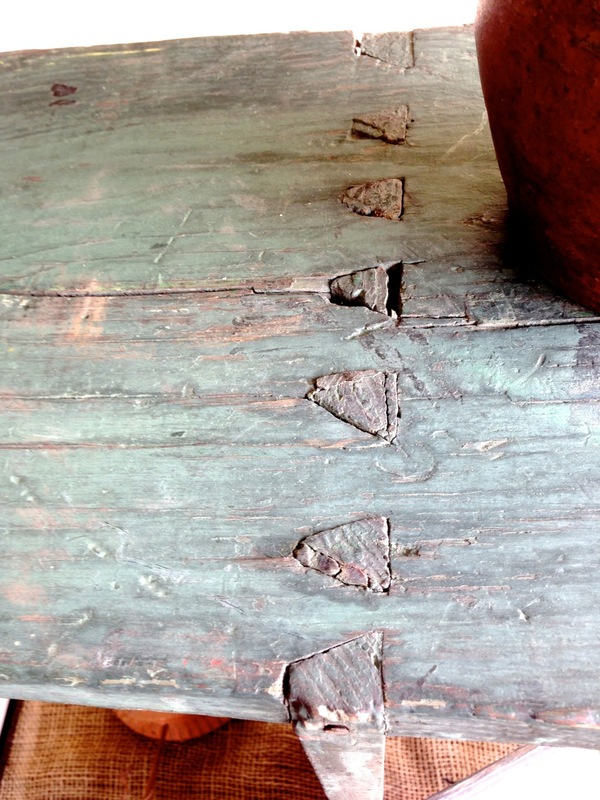 And here is a close-up of the corner and a foot. Old or not, it is interesting. Click HERE to see the full set of box images. I didn’t pay a lot for it. But I do like it. Well, it’s Easter here in the US, whether you are celebrating it in the religious sense, the secular sense or just annoyed because the Home Depot is closed. Not being able to send out any Easter Eggs, I will try to do the next best thing and share my pictures of painted chests. There seem to be four major categories of painting. First is just painting the chest to color it. Nothing artistic. Just paint. Then there is faux graining. Making the wood look like something it isn’t. Better wood. More interesting wood. Some are more realistic. Some less so. More elaborate graining. 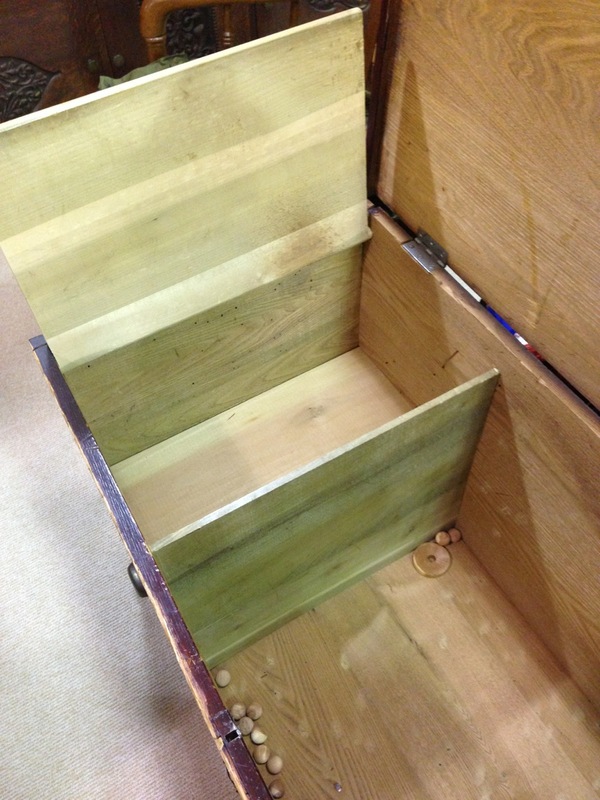 Creating a mitered panel chest. 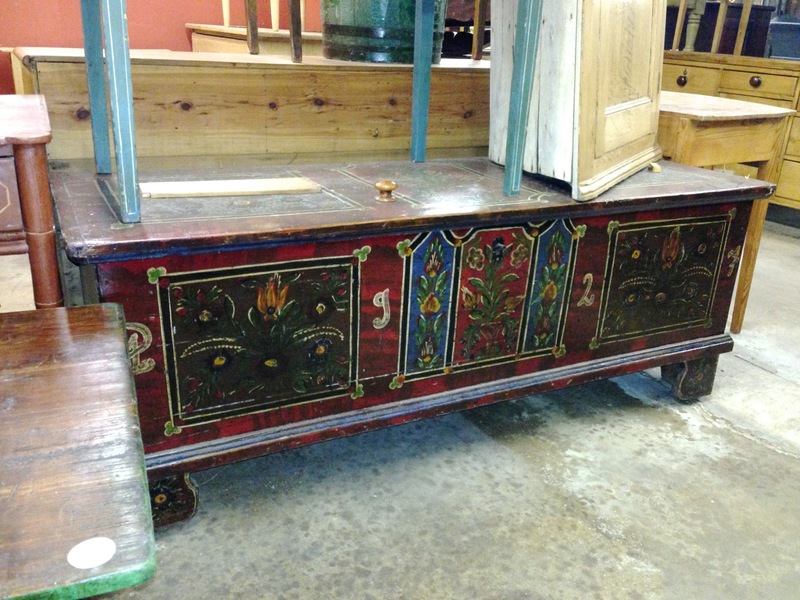 Decorative painting. Exploring ethnic and regional motifs. Like faux graining only not quite. Two for the price of one. Only twice as much. You can see the entire set (now called an album) of 172 image by clicking HERE. Soon, we will get back to the serious business of furniture exploration. But not today. Back to Furniture Stuff. For the Time Being. Enough with the attempts at humor, the hysteria, the mystery. Time to get back to the serious business of documenting furniture. My life’s work and passion. It’s something I do to kill time. This is a set of pictures I took in driving back from Winston-Salem with a stop in Greensboro. Nothing too fancy but a lot of mid-level stuff and primitives. No pontificating. No analysis. No brilliant stories. No life lessons. Just furniture. 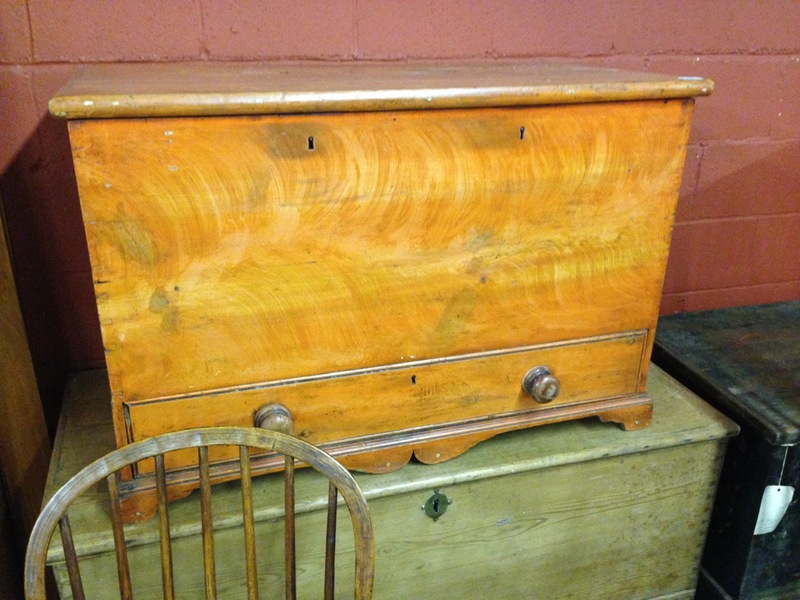 First highlight piece is a blanket chest with drawer and a till on top of the drawer. It must have been interesting to layout and construct. 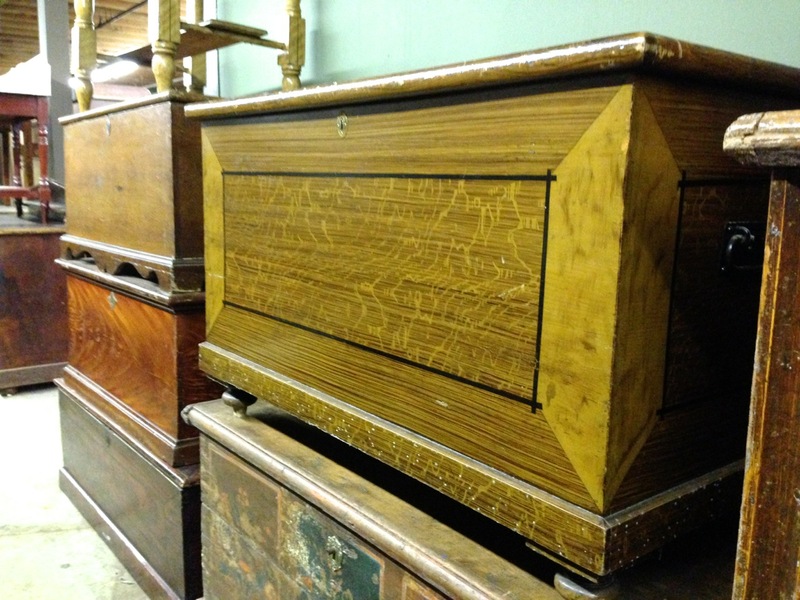 The drawer is useful to retrieve stored things when the chest is under 200 pounds of stuff. 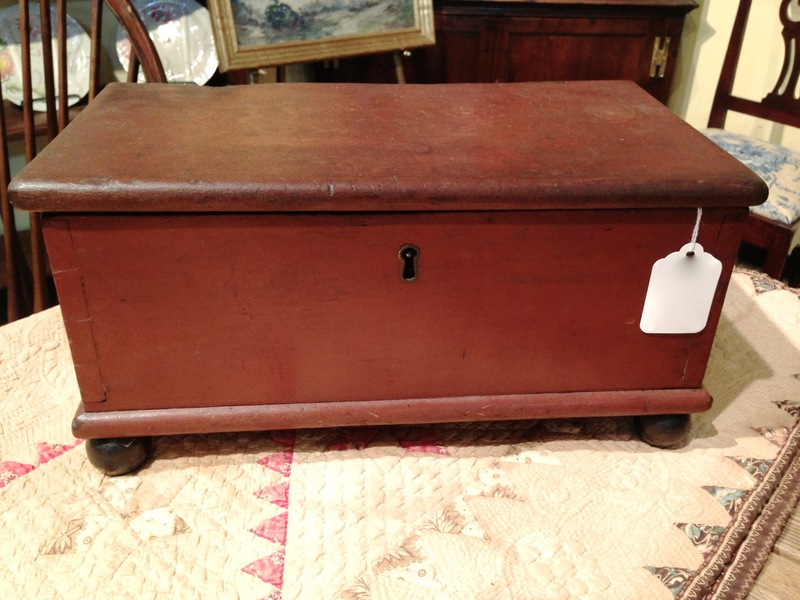 Blanket chest with drawer. 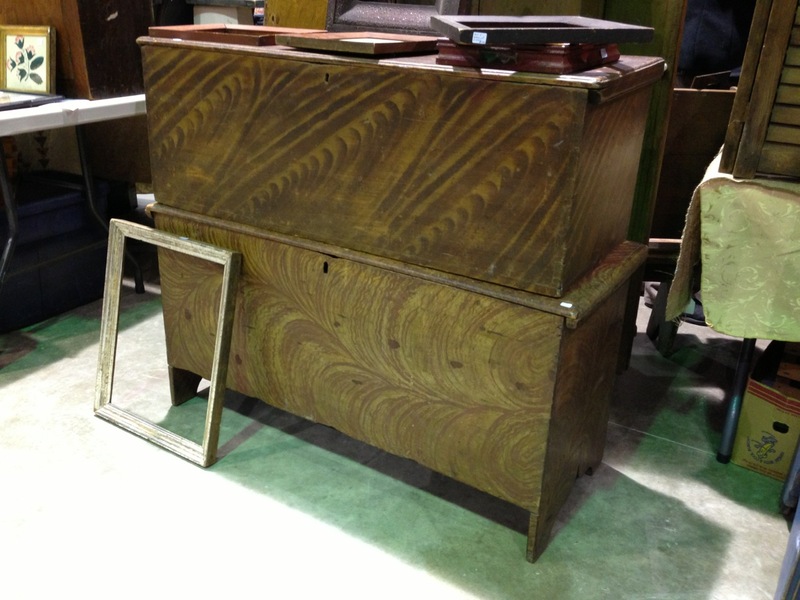 Click to see the interior with a till atop the drawer. 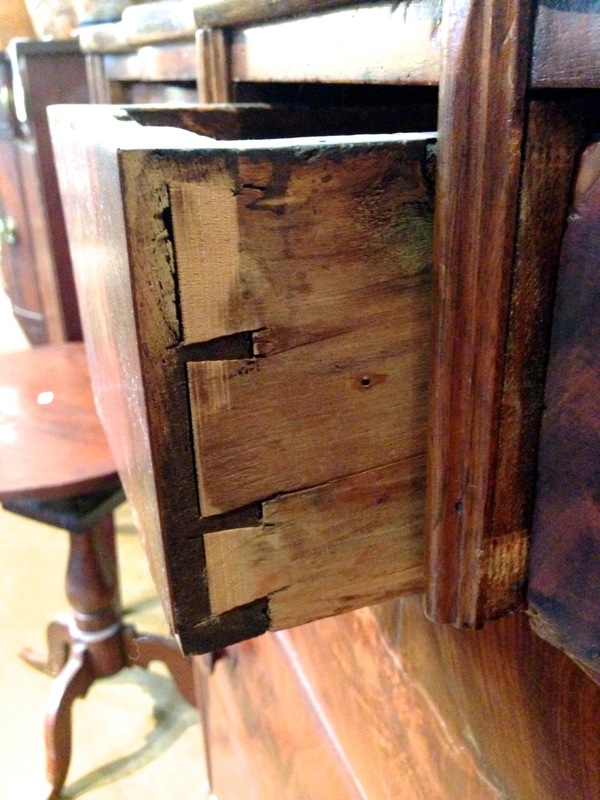 The other variation on what we have come to expect is this dovetailed drawer. 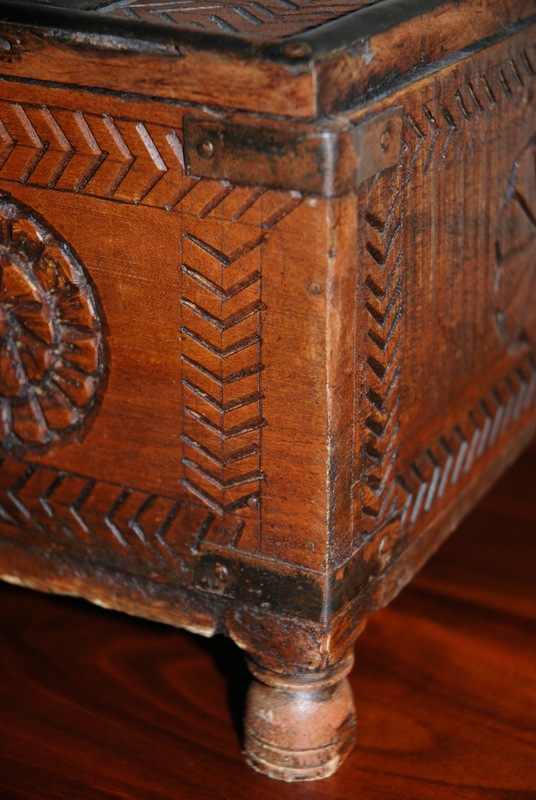 The dovetails are of the sliding variety and run vertically. One way to put a narrower drawer on a wider drawer front. 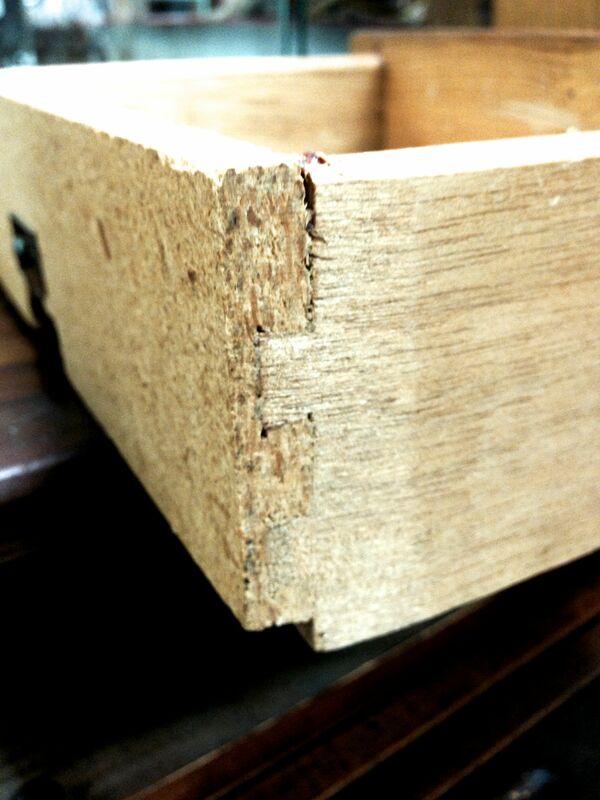 Vertical sliding dovetails. 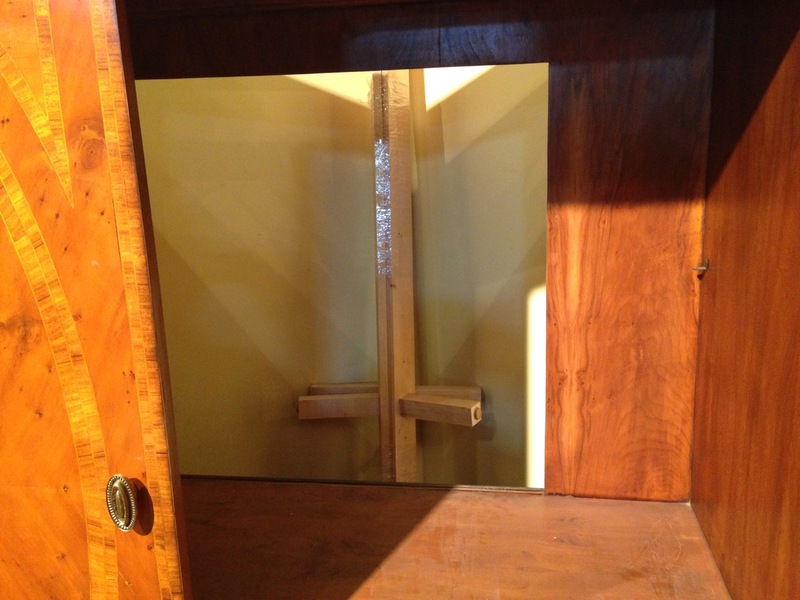 Click to see the corner cabinet in which the drawer dwells. Many of us believe that the base is not original to the corner cabinet but a later addition. We could be wrong. Wouldn’t be the first time. And there are quite a few interesting pieces of attractive hardware. But, wait!. There’s more… Click to see the entire 125 picture set again. Let’s say you have just finished a book on Latvian linden ((Tilia cordata) campaign furniture. You believe in the book but marketing tells you you might only sell 25 to 30 books. Using the traditional printing model, you can’t make money printing 30 books. Shipping alone eats up all your profits. Using their new specialty printer, our friends will be able to quickly print limited interest books in a cost effective manner. Their new, short run printer. I am personally looking forward to the possibility of a greatly expanded, limited interest catalog. Those of us interested in truly obscure topics will no longer have to depend on hastily written, inaccurate Wikipedia articles. We can now have hastily written and inaccurate books as well. If it’s in print, it must be true.